One of the most powerful themes seen throughout scripture is the way God takes people who are strangers and makes them into family. At Living Hope Fellowship, we believe that God uses our relationships with each other to grow and shape us into the image of Jesus, forging us into a family through His grace at work among us. It is from this belief that we strive to make each Community Group a place where someone can grow in their faith, receive encouragement and hope, and know that they are loved and cared for. By meeting together regularly we are able to invest in one other as God continues to mold us into a community of faith, hope, and love. We have Community Groups planted all around the city, allowing us to connect with several different communities in the greater Baton Rouge area. The group’s time together is centered around sharing and prayer for these three important aspects of life in Christ: your personal relationship with Jesus and the things you are learning along the way (Commandment 1), the people God has put into your life to love and care for (Commandment 2), and corporate interaction with the scriptures. With Commandment 1 and Commandment 2 in mind, there are 6 Core Components of our Community Groups. Gathering – Groups meet together regularly, scheduling in nights of fellowship and men’s and women’s gatherings, as well as nights off to encourage family time and rest. Bible study – The desire is to be students of the Word, together; learning to study and apply it to our lives. Prayer – Praying with and for one another is one way God forges us into a family, as we come along side one another and bear one another’s burdens. Care Giving – Each group strives for openness about what is going on in life, and works together to support one another in whatever ways are needed. Hospitality – Biblical hospitality is an outworking of The Gospel, and includes treating strangers like family. Community Groups are a great place to help people take that next step toward “family” through Jesus in community. Missional Emphasis – Each group finds their own way to help make the Kingdom of God known in their part of Baton Rouge. 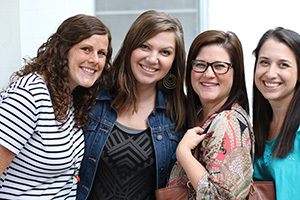 Through the unique rhythms of each group, rooted in His covenant faithfulness and love, He forges these groups into families, and there is always an open spot for anyone who wants to come and be a part of what He is doing. For more information on community groups, stop by the information table on a Sunday morning or email megan@livinghopebr.com. To visit or join a group, email the leaders on the locations page and they will be happy to answer all of your questions! For those who may need childcare, each group has a plan in place for taking care of the kids, so just ask the leaders of the group you are interested in and they will get you all of the details.